Coffee culture is huge here in Vietnam. In the mornings, old men gather to chat over coffee and cigarettes. In the afternoons, office workers squat on tiny sidewalk stools for their afternoon pick-me-up. In the evenings, many cafes function as bars, blasting loud music or offering karaoke. Unlike back home, this is neither a quick energy boosting pit stop nor a place to stare into a laptop. People (mostly men) come here to chat and linger for hours. 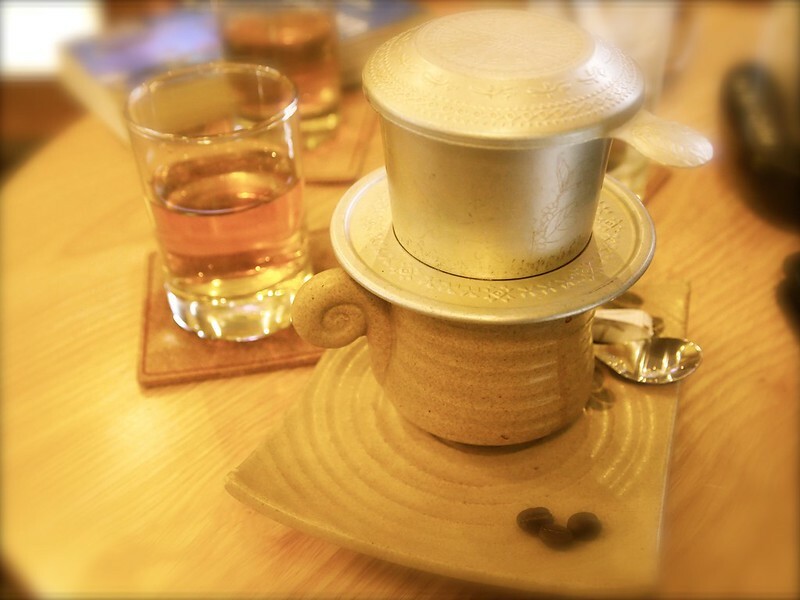 Traditional Vietnamese coffee is brewed in something called a phin, a small drip filter that sits on top of a coffee mug. Finely ground, dark roasted coffee beans from the central highlands of Vietnam are tamped down and hot water is poured into the chamber, slowing dripping a thick, strong brew into the mug (this can take up to 10 minutes!). 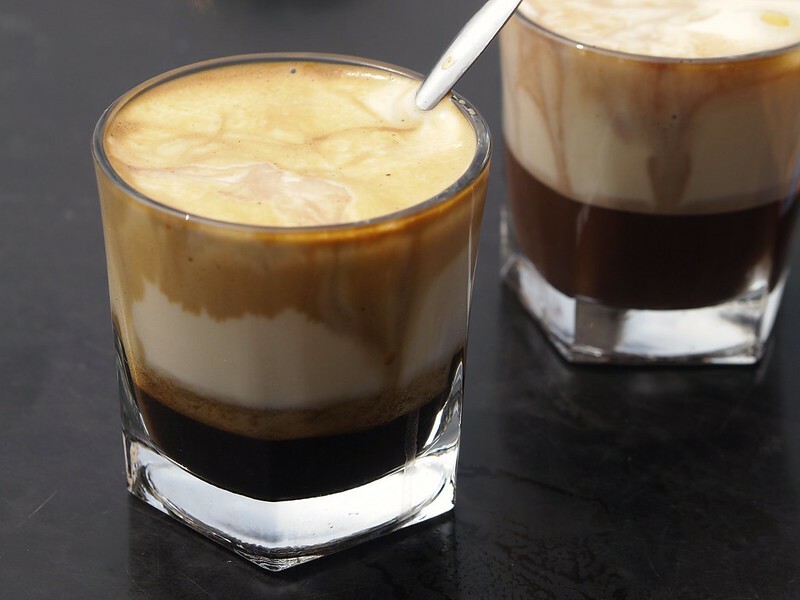 Like elsewhere in Southeast Asia, it’s often mixed with sweetened condensed milk out of the can. Since it’s hot and sticky day and night many places in the country, it’s often brewed over ice. 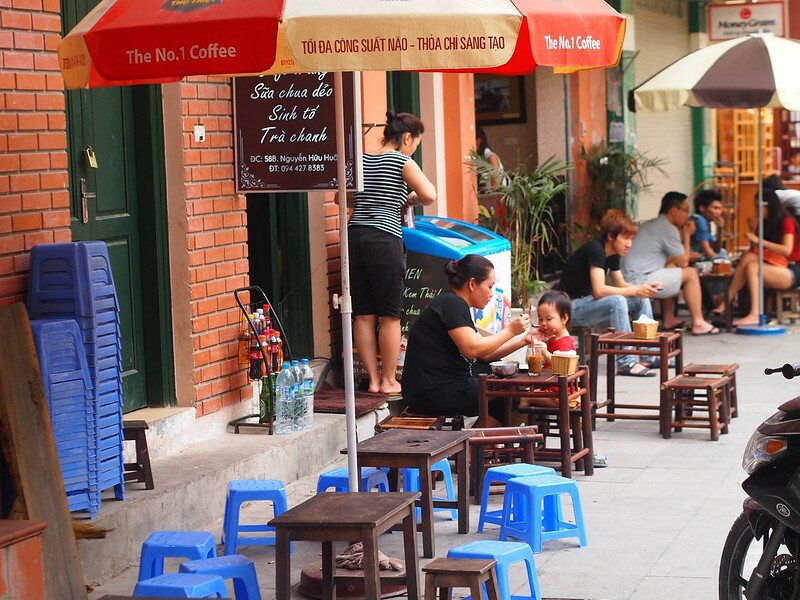 Vietnamese coffee is served everywhere from hip, western-style cafes with comfy couches and free wi-fi to sidewalk stands where you sit on tiny stools made for 5 year olds on the side of the road (the latter being our favorite). Even bicycling out in the countryside, a house on every block has a kid selling refreshing iced coffees and tra da (iced unsweetened green tea). Speaking of tra da, most places serve complimentary glasses to wash down all that strong coffee. We love it – we’re addicted and plan to keep a pitcher in our fridge when we get home. We almost always got it at the traditional places full of locals, but sometimes had to ask for it. Tra da is also normally available at restaurants and street stalls for just a few thousand dong, far less expensive than beer or water! A basic coffee cost us anywhere from 6,000 VND ($.29 USD) out in the country to 30,000 VND ($1.43 USD) in fancy shops. Typically, we were paying 10-15,000 VND per cup (a few thousand extra with milk). Quality varies widely. The best cups are chocolatey, velvety smooth, and buttery (in fact, the beans are traditionally roasted in clarified butter!). But Vietnam is also the number one exporter of Robusta beans, the cheap crap that makes up your morning cup of Folgers or instant coffee. 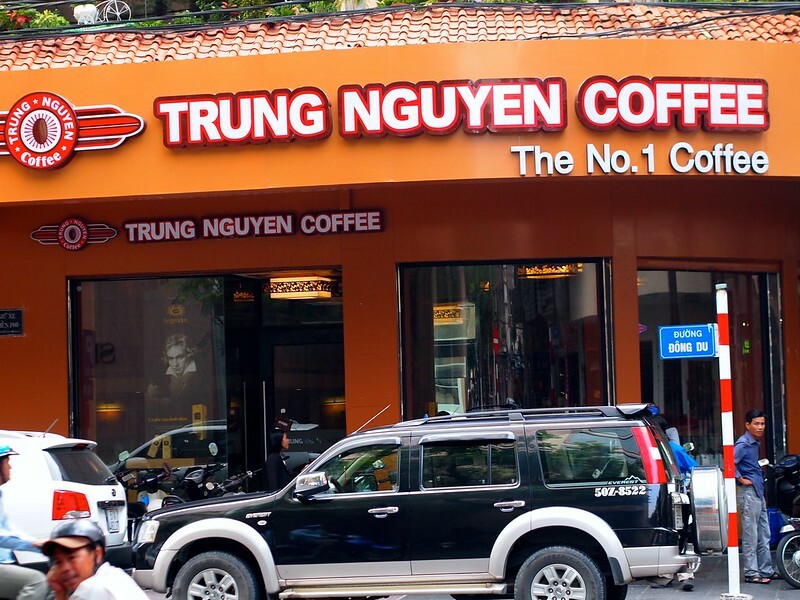 A slightly pricey but reliably good chain we found in both Saigon and Hanoi is Trung Nguyen. Many places claim to serve their beans (but probably don’t), so seek out their cafes. 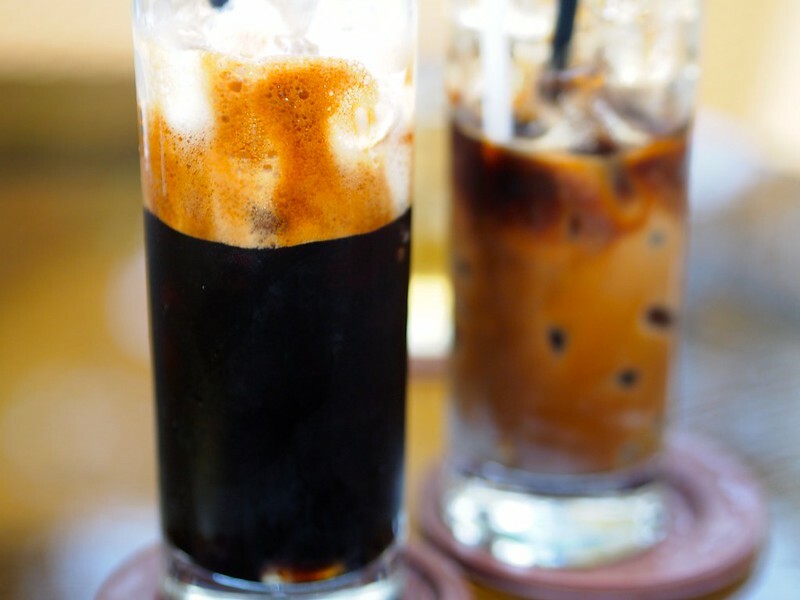 Ca Phe Trung (literally egg coffee) is made by whipping a raw egg with sweetened fresh milk, then dripping coffee over the frothy mixture, which sinks to the bottom underneath the foam. This tastes like eggnog (why haven’t I thought of adding coffee to egg nog before?). On a cold winter’s night, a shot of bourbon wouldn’t be a bad idea, either. If you’re feeling extra naughty, go for the Ca Phe Trung Cacao, which is the same thing, mixed with chocolate! Ca Phe Trung seems to be unique to Hanoi. 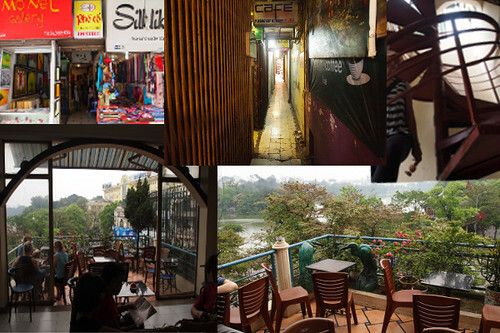 We found it at Cafe Pho Co (11 Hang Gai, 35000 VND per cup), where you go through the back of a silk shop, through an alleyway, and up a spiral staircase onto a rooftop with a stunning view of Hoan Kiem Lake in the center of Hanoi’s old quarter. 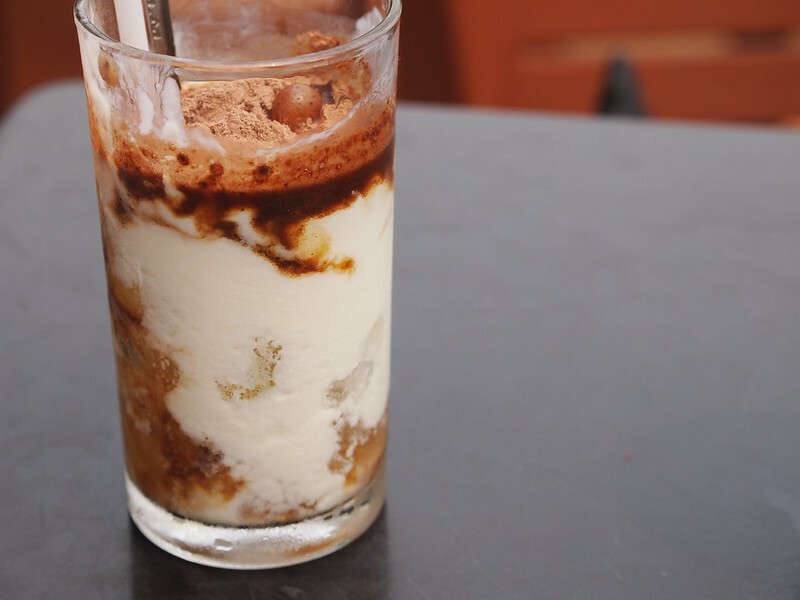 For a cheaper but equally delicious version, we found it at Sen Cafe (58 Nguyễn Hữu Huân, 25000 VND per cup), where we squatted on plastic sidewalk stools watching life go by while the friendly motorbike valet practiced his English on us. Sen Cafe also has killer homemade frozen yogurt. Try the avocado flavor! Pictured above is Ca Phe Sua Chua Cacao Da (Iced Chocolate Yogurt coffee) also at Cafe Pho Co. Vietnamese coffee is dripped over yogurt and mixed with Milo powder (similar to Nesquik) for a sweet and sour concoction that tastes like melted coffee flavored frozen yogurt. 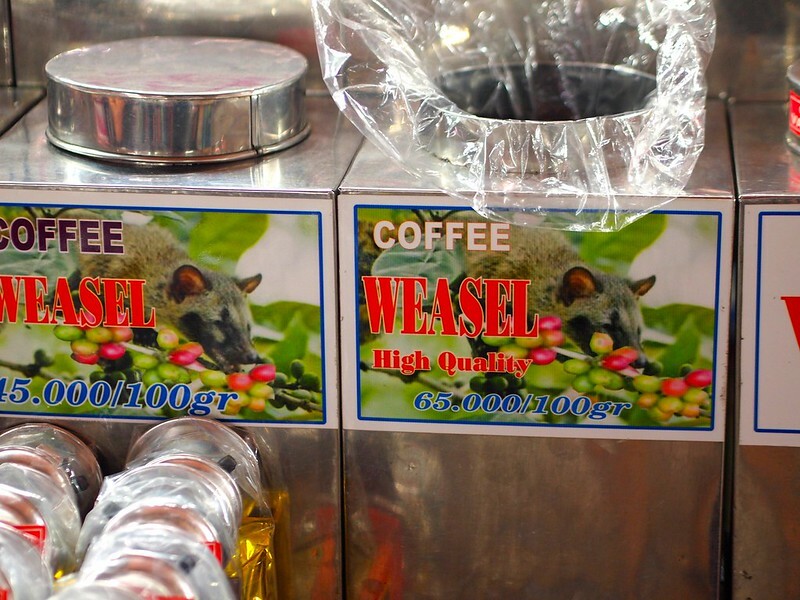 Weasel Coffee is for sale at markets from north to south. Most of it is fake. If you’ve never heard of Weasel Coffee, it’s brewed from beans harvested from animal droppings. And it’s the most expensive coffee in the world. To quote Dave Barry, I’m not making this up. 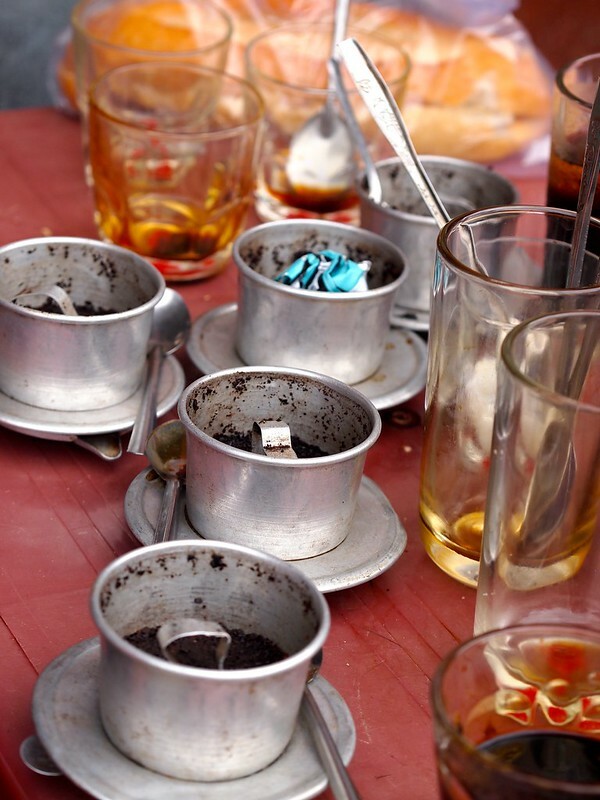 I tried a cup at Huong Mai in Hanoi. It was good, the best cup of coffee I had in Vietnam. But at $75 US/kilo for the real stuff (the beans above are probably fake), I’m not toting any home. When the coffee is so cheap and so good, it’s easy to knock back a few too many! 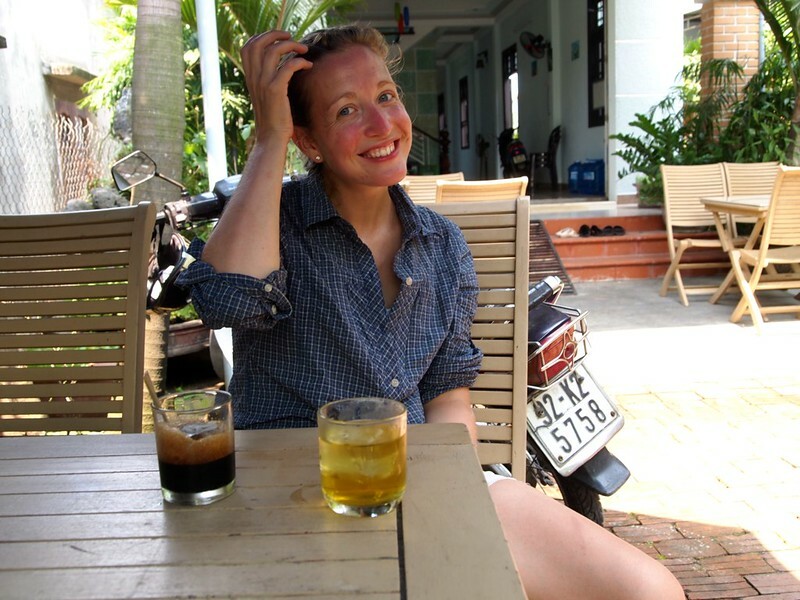 4 Responses to "Getting Buzzed in Vietnam: A Coffee Lover’s Guide"
Thanks for this write-up, Jordan. It’s great to see someone actually integrating Vietnamese culture and language into their own experiential article. 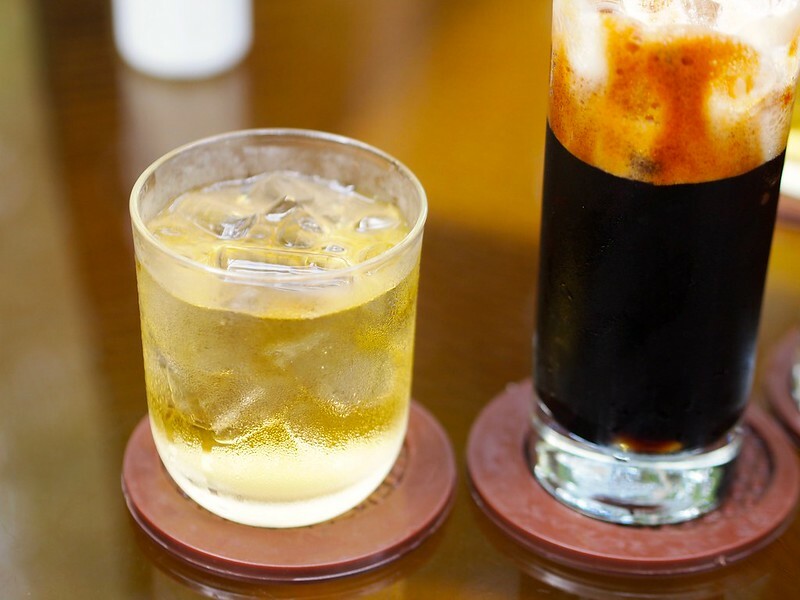 Loved that you included how to order the coffees in Vietnamese in this write-up. This actually helps people traveling. On my way to Cafe Giang in Hanoi to grab a hot chocolate egg coffee right now. Thanks for the help and safe travels to you wherever you are in the world! Stephen, thanks for the kind words. Enjoy your coffee, we are jealous this morning! We created this site to chronicle our 2013/2014 trip around-the-world. Read along with us through Southeast Asia, India, Africa, Turkey, and South America. Machu Picchu: a whopper for our 100th post!